Structural monitoring systems should not be dismissed as a necessary and expensive evil. Peter Vanderzee and Seth Condell argue that they should even generate a return on investment. Structural monitoring systems risk being dismissed by bridge owners as too expensive and impractical due to the data-intensive, academic-driven applications that typically characterised the first systems on the market. But best practice developed over the past decade has enabled the technology to become more cost-effective and practical for commercial use, and it should also provide a return on investment. While the benefits are now widely accepted, the burdensome amount of data produced by early applications is largely to blame for preventing the technology gaining the acceptance it deserves. Owners should consider the purpose of structural monitoring technology, and how it can help them maintain their assets effectively and provide a baseline of structural performance. For newer, significant structures, monitoring technology can validate design and construction and support plans for more efficient inspection and maintenance routines. All the same, many monitoring installations continue to capture massive amounts of sensor data, which leads to problems with data storage, adds significant expense, and makes analysis overly complex, often with limited practical value for bridge management. While this approach was valuable in the early years to test the limits of the technologies, for most installations, massive amounts of data is neither technically warranted nor cost-effective. Bridge owners can benefit by exploiting fewer sensors that capture less data, and focusing solutions on streams of actionable data to achieve the desired results while providing a return on investment. While there will likely never be a standard approach that works for every structure, best practice has been developed over the past ten years from solutions deployed on projects in Europe, Asia, and the USA. Ultimately, a structural monitoring solution should be simple, rugged, reliable, and easy to understand. Owners should be aware that data intensity is overrated. Experience suggests that capturing and returning data six to ten times per day is sufficient for detailed analytics, including building calibrated finite element models. While higher sampling rates may be desirable for monitoring specific structural defects or certain dynamic responses, much can be learned from the structure using a simpler approach. Early monitoring systems were developed in a laboratory setting, hence sampling rates of 10–100 data points per second, or higher, were often recommended for academic research. Capturing data at these high sampling rates will overwhelm owners with data and create additional costs. Data collection should, as a minimum, coincide with peak and non-peak traffic times in order to capture best and worst-case loading events. The Runyang Bridges over the Yangtze River in China were completed in 2005 and included a structural monitoring system costing nearly US$3 million. However the bridge owner has admitted that data interpretation and analysis requires a significant ongoing labour expense, given the amount of data from the current system. The second thing to note from best practice experience is that sensor accuracy is overrated. It is possible to specify and purchase structural monitoring solutions capable of accuracy to one microstrain, but this level of precision is not necessary for practical applications and again leads to challenges and unnecessary costs in processing the data. The additional investment needed to obtain such accuracy will not necessarily produce improved actionable data. Accuracies ranging from 20-40 microstrain are more than adequate to conduct sophisticated analysis, including calibrating a finite element model. It is particularly important to use only sensors that fit the need. A substantial variety of sensor types has been developed over the past twenty years to augment traditional strain sensors. Tiltmeters, accelerometers, and even corrosion sensors are available that can provide data on bridge or member condition. If a particular sensor is not essential to determine the actual condition of a bridge, there is practical value in adding it. Displacement and temperature sensors are essential for structural monitoring but other sensors should pass the test of necessity before deployment. For example, the Minnesota Department of Transportation reports that corrosion sensors on its new I-35W bridge have been problematic, but temperature sensors have provided useful data because thermal effects have a substantial influence on the structural behaviour of the bridge. Another issue to consider is that monitoring periods can be underestimated and most short-term monitoring has limited applicability. When conducting static load tests to determine a bridge’s ability to safely carry a known load, for example, a short-term installation is appropriate. However, in service a bridge is subject to a range of applied live loads and thermal cycles over time. Experience suggests that structural monitoring is most effective if the owner captures data over at least one full thermal cycle, as opposed to a period of one or two months, since thermal cycles can account for more than 80% of the observed strain in a bridge member. Having strain and thermal data covering a longer period also supports the development of calibrated finite element models, which provide invaluable information and serve as management tools for bridge owners. They allow stress concentrations to be identified for guided inspections, abnormal structural behaviour to be revealed, and progressively-deteriorating conditions detected. The number of sensors should be minimised at first and progressive diagnostics allowed for. The application of the minimum number of sensors required to capture essential information for subsequent analytics will maximise the owner’s return on investment. However the system controller should be designed such that additional sensors can be incorporated or existing sensors relocated without great expense. Using fewer sensors helps to avoid the data overload common to academic-driven systems; but also, fewer sensors generally result in a more reliable system. Hardware and software installed outdoors in potentially harsh conditions tend to become less reliable as the system complexity increases. When diagnostic information provides a better understanding of the structure and its hot spots, sensors can be relocated for improved effectiveness. This can be compared to the inspection process used on signature structures, wherein an annual or biennial inspection serves as a baseline condition assessment. As particular areas of concern are identified, in-depth inspections are performed to meet specific needs. To help ensure a reliable monitoring system, professional installation is essential. 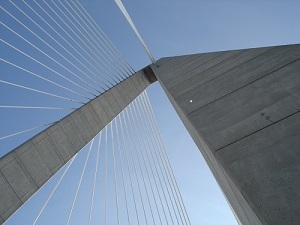 There are substantial safety risks involved in installing sensors on bridges, so the task should only be performed by professionals with adequate safety training and equipment – in particular bridge owners should be wary of using graduate students, who may not have the requisite insurance coverage or safety training. If the monitoring period exceeds three months, using conduit for cable runs is strongly recommended to prevent birds and small animals from damaging the insulation. Systems with wireless sensor nodes may also experience reduced reliability due to line-of-sight or electromagnetic interference and the eventual degradation of individual sensor batteries, as well as the added costs and disruption to replace small batteries. Crucially, the data centre must be managed by professionals able to provide believable reliability statistics to the order of at least five nines (that is, 99. 999% reliability), or the equivalent of around 25 seconds of downtime per month. Any less increases the risk of an owner not being alerted when strain or crack propagation that exceeds an established threshold occurs, and the potential impacts of such an event. Solution providers should be able to support a return on investment. While non-quantifiable value drivers should be considered, such as added safety margin, service reliability, improved load ratings, and so on, the use of hard-number financial analysis based on safely extending asset life is recommended as the primary metric. By simply accounting for the value of deferring capital expenditures for rehabilitation or replacement projects at reasonable interest rates, say between 3% and 7%, and factoring in the probability of successfully achieving that result – between 25% and 40% – owners should achieve a significant financial return, in addition to the benefits of enhanced safety and objective condition assessment. A prime example of an owner’s return on investment is the Great Pee Dee River Bridge in South Carolina which was classified as structurally deficient in the late 1990s and identified for replacement. The existing structure had to stay in place while the new span was constructed so South Carolina DOT explored several interim repair schemes, which would have cost US$825,000. Instead the DOT decided that health monitoring would provide an adequate safety margin to manage the existing structure during the construction of a new bridge. Savings were US$700,000 over one year. New bridges can typically make the most use of a system that determines responses to live loads, thermal loads, and weather-induced loads for example; the effect of permitted load crossings on the structure and the areas of highest stress concentrations help guide visual inspections. The system should also support the development of a structure-specific bridge management plan, including a calibrated finite element model, if warranted. Monitoring systems designed for older bridges have a different purpose; the two most important functions are to objectively determine the actual structural condition and to ensure continued safe operation. By producing objective data regarding the condition of structures, a monitoring system can enable owners to safely defer major repair or replacement projects while ensuring that the structure continues to perform adequately. The system allows owners to monitor the progression of visible defects, confirm the necessity of load restrictions, and monitor peak strain to determine appropriate use. In addition, a structural monitoring solution can be applied after repair work to confirm that the procedure worked as expected. On the Arthur Ravenel Jr Bridge over the Cooper River in South Carolina, the DOT is using a structural monitoring system to characterise structural response to various loads, to verify certain design parameters, and to confirm construction efficacy. The system includes two independent controllers, 24 peak strain sensors – both compressive and tensile – and six temperature sensors, with the flexibility to double the sensor count very cost-effectively, as necessary. All cabling was installed in conduit for long-term reliability, yet despite the availability of line power, back-up batteries were included to further enhance reliability. The monitoring system polls each sensor every minute, but only relays data ten times per day, at pre-determined times that can be remotely adjusted. The monitoring system software allows the owner to capture instantaneous data over the internet from desktop, tablet, or smart phone, or download it into an Excel spreadsheet. Peter Vanderzee is President and CEO of Lifespan Technologies and Seth Condell is Director of Bridge Technology at Parsons. Copyright Bridge Design & Engineering UK (www.bridgeweb.com).